I know. January is nearly over, but if you keep reading I promise to post new blogs more often! Apologies for not writing about Christmas beers at the end of last year. I’d had high hopes of finding one I liked but the snows of December meant my mission was restricted to a limited area. I only managed to look in the local supermarket and backstreet pubs but found no yuletide ales on offer. Not long after Christmas Day though I met up with a friend at The Isaac Merritt, one of Paignton’s Wetherspoon’s, and had a few pints of Marston’s Christmas Pudding Ale. The promised cinnamon flavour the barwoman told me about wasn’t quite as obvious as I’d hoped, or indeed expected of a Christmas beer, but it was very drinkable. However, because it didn’t taste especially festive I’m not sure it counts as ‘a Christmas beer I like’ so the search will continue this year. At home during the festive season I went down the bottle conditioned wheat beer route mostly in the shape of Erdinger’s Weißbier, a refreshing and very drinkable Bavarian brew with citrus notes to it. 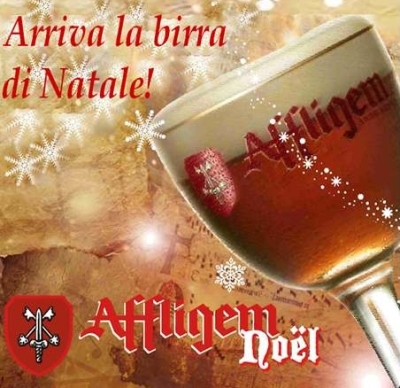 What I really wanted was the one Christmas Ale I have come across and liked (so much so that there was a rather infamous episode of over-indulging in it in Paris a couple of years ago) which I had thought was Affligem Noel. In my mind’s eye this was a golden-coloured beer with beautiful sweet, spiced flavours (cloves and cinnamon) but a little internet research has made me doubtful that’s what I was drinking in Paris as some websites describe it as very dark in colour. I suppose I’ll have to wait till the festive season rolls round once more, find some to try and see if it is the delicious – and very strong – beer I think it is. As the cold, dark part of the year is not quite yet behind us there is the possibility of another taste-broadening challenge for me. Those that know me, or have visited this blog before, will know that I am a bigger fan of Golden Ales and summer beer than I am of bitter or darker brews – not exclusively but as a rule – (I still love you Broadside and then there’s dear, dear Old Hooky). So news of CAMRA’s Winter Ale Festival and announcement of the winners of Champion Winter Beer of Britain caused me to wrinkle my nose rather than salivate in anticipation, but I think I owe it to the real ale cause to give these styles of beer more of a chance. Hop Back Brewery’s Entire Stout won Supreme Champion Winter Beer of Britain 2011 at the Festival. I’m a big fan of the Wiltshire brewery’s Summer Lightning so maybe this award winner would be a good place to start. Advice as to where I can try a pint in the Paignton area gratefully received, failing that I’ll have to track down the bottle-conditioned version. The other Overall section winners were Chocolate from the Marble Brewery in Manchester (Silver) and the Leicestershire based Dow Bridge’s Praetorian Porter (Bronze). I have two conflicting memories of very dark, winter style beers but irritatingly I can’t remember precisely what either of them was. There was one I liked that I used to drink at a pub called The Ancient Druids which is near the Grafton shopping centre in Cambridge. It may have had Druid in the name. It was a strong, almost black beer that I was impressed enough with to take my brother to the pub to try a pint. It wasn’t the greatest pub in the world though so I didn’t go there often and as it was around 15 years ago I think I’ll forgive myself for not being able to remember. I can’t remember the name of the one I hated either, only that I had it in The Seal in Selsey (a marvellous, friendly pub) one January and it tasted like a pint of blood. I found it so unpalatable that I donated it to my brother and got a pint of something else. But I think I’ll put that to the back of my mind and instead think positive thoughts about Stouts, Porters and Old Ales and how much I enjoyed that black beer in Cambridge and get out and taste the Dark Side. I’ll be sure to report back.